It was my pleasure to help Christina sell her beautiful home! She worked so hard to get us into our dream home and for that we are forever grateful! Four days and my house was sold at full price! Moe sold my house in 2 hours! She is a friendly but straight forward. She uses the most current information to get you the best price on your house. Moe has great negotiation skills that work for her client. i have used Moe for the past 30 years and would never think of using someone different. I have referred her to my friends, she is the best!! 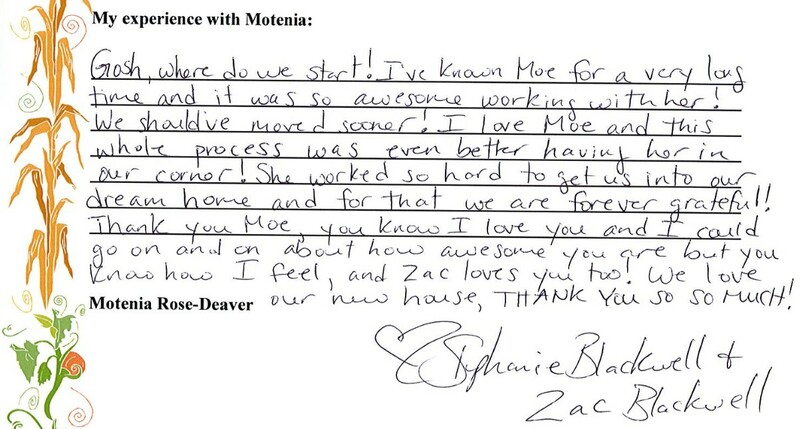 We’ve had great experiences both times we bought and sold our homes with you. It’s nice to have the kind of expertise, compassion and care in a realtor that you give to each of yoru clients. We hope not to move anytime soon but if and we do, we will definitely give you a call again! Thank you for your help! When I was introduced to Moe, I was upside down on my mortgage and recently widowed. Moe Helped Me Buy a condo in the Denver area as an Investment. I live in another state and was referred to her from a friend who has used her to buy 2 condos. I met with her once while visiting the Denver area. After our initial meeting, we looked at some listings and she immediately got a feel of what exactly I was looking for. I left home and she kept me in the loop with everything! She’d call me after looking at a property, send me photos and a virtual tour of the property. Moe looked all over Denver for me until she found the one that was “Just Right!” As soon as we closed on my condo, she went to town getting it cleaned/painted and ready to rent. She provided me with a list of things that needed to be done and I just went with it. She did a great job getting a vendors together for deep cleaning, duct work, carpet cleaning, painting and a handy man for the honey-do’s. Once it was all done, she staged the property and sent me some photos she took for my rental ad I was to post on the internet. She definitely went above and beyond what should be expected from a real estate agent. Motenia helped us during a very trying time in our life. She went above and beyond to prepare us every step of the way as to what to expect and what things may or may not happen. She held my hand personally when I was just too tired or too stressed to handle anything else that day. Our life has been a roller coaster the last couple of years and Motenia was very professional and companssionate in her dealings with us. She alwasy kept our best interests in mind. At one point I would have let someone move in that I knew needed a place to live before we closed but she explained that it had to be “arms length” and it was not in our best interest to do that. I thank her not only for the sale but her compassion and understanding as well duing the whole process. We have worked with Motenia on several acquisitions of our own. I typically do not comment on service received unless it is extremely good, or equally as bad. Moe’s service is the best. In my experience, Moe has always gone over and above the call when dealing with her clients. She is tops in professionalism, competence, has the tenacity required to “get ‘er done”. I’ve referred her to two associates , for whom she has closed deals. I’ve received positive feedback on her from them as well. She’s a keeper! Thank you for your message. What a struggle! You are so reliable, efficient and organized; you do not lose your sense of humor as you have a cheerful heart. I know that my mother would be very pleased that the daughter and son-in-law of good friends will now be living in the house. We feel so connected with you. You did a wonderful job handling everything and keeping me informed. Any time you would like to visit Germany you are most welcome. We would enjoy having you as our guest. There are lots of nice things to see and do in Germany and we would be very pleased to show you around. Please, keep in touch. All the best and a wonderful weekend! Show stoppers certainly don’t stop Motenia! Between her outright knowledge and invincible character, I don’t think anything can stop her. She cares very personally for her clients. Motenia is a rock – and definitely one in a million. I feel it necessary to communicate the high level of excellence and commitment to my cause performed by Mrs. Deaver During the entire process, she never failed to demonstrate tremendous professionalism and knowledge of the real estate business. Her patience and ability to always keep me up to date on what was happening, allowed me to put a great deal of trust in her. We have done business with Motenia for several years. As a business woman we have found her honesty, knowledge, and intuition of the highest standard. You were an absolute delight to work with! Motenia, you were much more than my real estate agent. You became a friend who worked as my advocate and adviser through all phases of my home. From selecting properties which met my criteria, to facilitating my mortgage, to recommending furniture stores. You were an absolute delight to work with! Moe is the consummate professional who is not afraid to kick off her high heels and mop a floor to satisfy her fastidious standards. She sold our 100 year old home that we had lived in for 28 years. She guided us through the emotional (on our end) selling process with honesty and integrity. She was ALWAYS there to improve or correct any negative detail a potential buyer might see. Moe will call you with good news, bad news and “no” news just to make sure you’re okay and understand where you are in the process. If you want “hands on” from a realtor who REALLY cares about you and your property, Moe will deliver “Hope”. Words cannot express how thankful I am! Thank you Moe and the entire MRD Team for your dedication and continued patience in selling my home at Cape St., words cannot express how thankful I am!